I was among the few fortunate to be present at the recent unveiling of the identity of the most promising retail venture of the century – I am not exaggerating… indeed, it is. 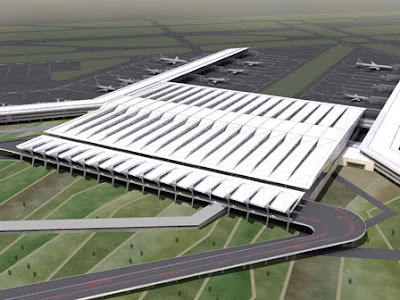 I am referring to the upcoming new Terminal 3 at Indira Gandhi International Airport (IGIA), Delhi. The Terminal Building spread over 50 lakh square feet would be able to cater to over 30 million passengers per annum (mppa) in 2010 and would be able to scale upto 54 mppa by 2020! By far, this would be among the top five biggest airport terminal buildings in the world and possibly the biggest in India. 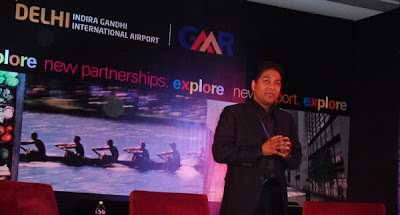 The Airport is ably managed by the GMR Group – leaders in Infrastructure, Power, etc, who also manage the Rajiv Gandhi International Airport at Hyderabad. Many would know that recently, the Hyderabad Airport was ranked the fifth best airport in the world in the five-fifteen million passengers a year category. The council, an international association of the world's airports, has also ranked the IGIA as the Best Improved Airport in the Asia Pacific region. All this, thanks to the persistent efforts of the GMR Airports Team, ably lead by none other than Mr. Kiran Grandhi, Chairman, GMR Airports Division. The new Terminal 3 which had a different Retail Identity earlier now has a new one developed by Holland based Marketing, Branding and Communication agency THEY. The new identity efforts, apart from choosing the Retail and Commercial partners, has been led by Suredj Autar, Chief Commercial Officer and Head of Strategic Planning for GMR Airports, The two day event was chaired on Day One by Mr. Martin Moodie, founder and editor of The Moodie Report, the world’s most trusted travel retail news website that never sleeps. Martin introduced Suredj as Supersonic Suredj - “He’s an ebullient, live-wire, irrepressible character who knows only one speed – supersonic.” Indeed, he is. I have known Suredj for over four years now since his previous role as Managing Director of HMSHost when he launched the operations in India and led other initiatives in the Asia Pacific Region. Back to the retail identity. The Dutch agency THEY’s founder Van der Vorst remarked - “For us, Explore exactly captures the diversity and forward-looking way in which India is progressing – and at the same time it’s a promise, a link to the customer; an invitation to the customer to explore all the great things that can be found in an airport.” The colorful logo was also unveiled and the various commercial partners would be able to integrate the new identity with their own, whether it’s a store that sells books, music, duty free products or coffee (like Café Coffee Day). What I loved most about the new name is its flexibility – it goes well with almost every category! The Retail areas are spread over 2 lakh square feet (that’s as big as a Mall, someone remarked in the audience). The retail areas have been carefully planned across the domestic and international areas. The common check-in area would have over 100 counters that could be used interchangeably for Domestic and International Airlines (similar to how it is at Bengaluru International Airport where I worked earlier and which introduced this concept two years ago). Focus has been given to walking areas, seating and shopping/dining areas such that each of it is visible from the other. So, when a passenger is walking, he/she cannot miss the shopping areas and the seating areas are close to the dining areas. While most of the shopping areas are on the same floor when a passenger enters, the food courts are a level above. There are two premium coffee outlets planned – a Coffee Day Square in the Domestic Departures and Coffee Bean Tea Leaf in the International Departures. And expect a host of F&B options – from Subway to Mc Donalds, Chinese delicacies to local cuisine, there is everything for everyone’s pallet. The Retail areas would sell almost everything possible, including an exclusive area for Luxury Retail and the highlight is going to be the much expected “Dilli Bazaar”, an area that would focus on the local favorites from the city. Later in the evening, there was a cocktail, sit down dinner hosted by none other than the Chairman himself which was preceded by a short interaction. When Martin Moodie who was on the stage with him asked how good the new Terminal 3 would be, Mr. Grandhi promised it would be 10/10 to a thundering applause and cheer from the crowd. When I met him later in the evening to introduce myself and to shake hands, he got up from his seat with a smile – a charming gentleman that he is, I couldn’t have expected more! His effervescent personality resonates in his organization and his team. Everyone was so cheerful and enthusiastic and like them, I am also eagerly looking forward to the grandest retail opportunity of our times… Watch this space for more updates over the next months. One of my previous columns claimed how this place would change the way Bangalore shops. It's only reassuring to see how true my own words were. Bangalore CENTRAL 2 at JP Nagar, Bangalore South, has indeed realigned the city's shopping needs. During my visit a week back, the new food court aptly named Foodstop! had opened its doors for public. 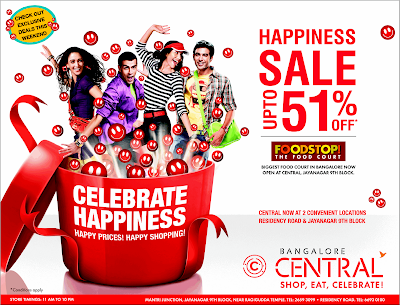 And no better timing than during the Happiness Sale - a biennial celebration that offers upto 51% Discount across various product categories. The Central Sale which is as popular as the End of Season Sale from Shoppers Stop (more of that on my next column) is a huge hit among consumers across cities. Central Malls, which is now present at eight cities across the country, offers shoppers a unique shopping experience that includes great offering with amazing discounts - twice a year. So, if you haven't been there yet, rush NOW. The foodcourt is located on the fourth floor, where the Box Office (the ticket booking counter) for the upcoming Cinema would be located. So, all patrons who wish to watch cinemas must pass through this floor - a brilliant idea to get footfalls into the foodcourt that would show results in a few weeks when the cinema opens. 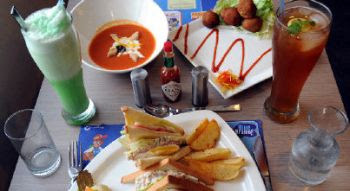 The foodcourt is well spread and brightly lit and has a busy neighbor - F123, a play area for children and the ones at heart. I beleive there would be atleast 100 seats or more for the six/seven food counters in the area. What I loved the most is the wide offerring - from continental to kannadiga fare, there's everything that discserning food lovers need. What I am bit confused is their adjacency. Will seek answers for that soon from my friends at Central. The first counter serves Juices and Ice-Creams. In a way this is the last one too. I wonder why this is the first. But maybe there's a reason. The pricing is moderate and the selections are wide. The next one is Bombay Blue, the flagship F&B concept from Blue Foods, which manages various other concepts all India such as Noodle Bar, Cream Centre, etc. and is also the one that runs F&B across various Indian airports such as Mumbai and Delhi. The menu offers lip-smacking continental food varieties, including Soups, Pastas, Sizzlers and the signature "Sizzling Brownie-Ice-Cream", my all-time favourite just as many of you. The portions are large enough for one person and the pricing is aggressive - just as compulsive to make the first-timers try. The next counter sells Indian fare - Rotis, Kebabs, etc. Nothing much to say as it includes almost everything that one needs in this variety. This is followed by Subway, the only branded counter (which was yet to be operational (as of 6th Feb. 2010). And this would be managed by my good friend Griffith David, a US returned techie who's passion to food led him to enter the F&B business a few years ago and is now one of the largest franchisses in South India for Subway and Baskin Robbins and is also opening some of his own concepts, and operates his flagship Subway/Baskin at Bengaluru International Airport since May 2008. My best wishes to him as this is his first in a Mall. The next counter serves traditional south-Indian/Kannadiga fare including various varieties of Dosas and Idlys. And the last counter serves tradional north Indian chat varieties. However, the missing counter is a Cafe - yes, there is no coffee and beverages available in this floor. I beleive Coffee and short-eats would do well in such food courts that offer continental/western style food as it goes well with such a menu. I am trying my best to fit in one of our cafes there, but yet to see light. 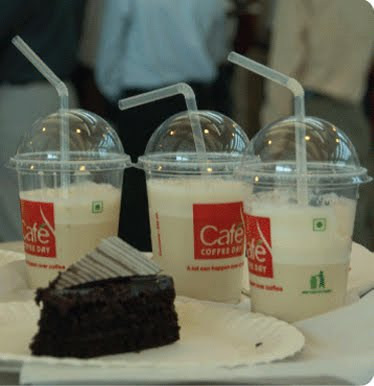 However, Cafe Coffee Day is located next to the customer Helpdesk in the second floor , which is mainly targeted towards the youth and offers casual wear clothing along with E-Zone, the Electronics format of The Future Group. The 200+ car parks in the basement ensures that there is enough space for those who drive in, apart from a similar number for bike parking. And there is a new unoffical Auto-stand just outside. this makes the visit to this mall an easy access, one of the most important moments of truth in retail. What I love the most about Foodstop! is the variety and range with superb pricing. A family of four could have a sumptuos, tasty, affordable meal from across the world for not more than Rs. 400/- (USD 9) which is a rarity today in Bangalore. Kudos to the Central Team for putting up such a fare. It’s been almost a year since I started writing this column – recording my own observations about the Retail Industry as well as analyzing and interpreting decisions and actions of Retailers and their activities. I must admit that I have acquired a lot of admirers and a few critics on the way – not on a personal note but more on a professional stance. 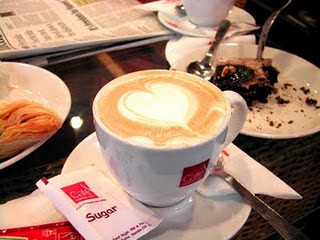 To make your reading more interesting, I am introducing a new column titled “Coffee Conversations”. In this section, I seek answers for queries that I have from Industry experts and stalwarts, while also discussing my own thoughts about the same. This is not mainline journalism – and I am not a journalist. Nor are those who opine spokespersons of their respective organizations. They are mere professionals who share their thoughts on certain specific topics. The next column is about the recent advertising marathon by Retailers and Brands – and the recent occasion being India’s Republic day that is celebrated every year on the 26th of January. Almost every brand/retailer have been showering discounts – from 10% - even 60% in some cases on a range of products including apparel, accessories, electronics, household items, etc. The only category missing conspicuously is Automobiles – probably they are happy counting their bucks, thanks to very good sales over the past three months. But this Discounting phenomenon brings some thoughts to my mind – what happens to the Brand‘s Equity in the long run? Shriram (SS): So, Raman, did you see all the nice ads overt the past few days on leading national newspapers inviting shoppers to buy products on discounts? Which was the one that attracted you the most and why? Raman Kalia (RK): In this season, it is not possible not to see discount and promotional advertising from brands across categories. 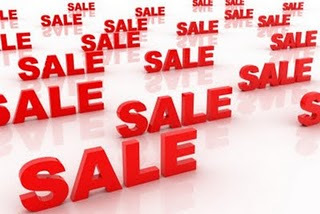 The season in a way has become synonymous with discounts, so I did notice advertising from apparel brands, electronics brands to host of others categories. There is no specific campaign that stood out in the clutter because these were plain announcement ads with each brand trying to outshout the other but even with these one, even if one tries, not notice the larger formats and in your face advertising. So I did notice Big Bazaar, Croma and some apparel brands advertising, but the bigger question is what I remembered beyond the fact discounts were on - Answer is nothing. 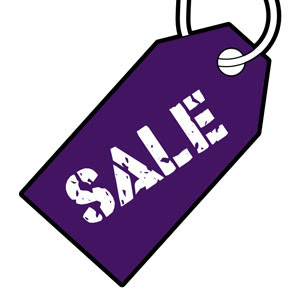 SS: Do you think most consumers tend to shop more when they find words such as “Sale”, “Best Deals”, “Save”, etc.? If so, then why? RK: It is no secret that Indian consumer is a value consumer and with discount seasons getting well established, purchase cycles are getting aligned to these seasons. It is more important for brands to consider with such seasons - are people spending more or actually less? On the surface, it might give an impression that people are spending more in that particular week, month or season but if a planned or need based purchase is getting aligned to that season, then probably brands are earning less, not more. Against this, if brands are able to build impulses, which are true in certain categories, say electronics or apparel, and expand their base of users, it can be said that consumers have shopped more. Brands should not look at just the season to base their assumptions but look at the full year to make a judgment whether discounts or sales or best deals have added value to their business or not. SS: In the long run, do you think these brands/retailers would lose their significance? Would consumers shop only when there are deals? RK: But of course brands/retailers would lose revenue and equity if consumers start buying during season. To take an example, if the MRP of a product is100 and offers a 20% seasonal discount year after year and the bulk of consumers start buying during that time, they are telling the brand we value at 80 and no longer 100, that means its premium has eroded in the consumer’s mind. The prime example of this is Benetton; you would rarely find people buying this, one of the most respectable and recognized all over the world brand, at full price in India any longer. It has become a discount brand, with weak associated imagery. SS: What about the Brand Equity? Do you think consumers would value the brand as much at a later date when they shop again in full price? RK: There is no single answer to this question; it depends from category to category. In certain cases it actually enhances the value of the brand because it offers a chance to experience or enter the category. Every brand has three set of consumers – core buyers, fringe buyers and non-buyers. As long as discounts do not isolate or create dissonance in core buyers and at the same time give an opportunity and a reason to fringe buyers/non-buyers such schemes add value. SS: Which categories according to you think have the least effect on their value? Can you elaborate with some examples? RK: Discounts, at the end of the day in a way mark the end of something and are a symbol of change, a precursor before the new comes. And in certain cases clearly demarcated time fragments which are well established. Let me explain this by picking up three categories; technology, apparel and hotels. Let’s start with the simplest one, hotels, you have season and non-season. Discounts and offers during non-season do not impact the rates that hotels charge during the season, why one because people travel less during that time, but it gives a chance to fringe or non-buyer to enjoy that exclusive experience. Even if a core consumer avails the opportunity it still does not erode the value because overall reason of a season is well differentiated from the non-season. Different opportunities, different reason, no dissonance, yet at the same time adds value to the brand in terms of revenue, consumer base and building brand equity. In case of technology, it is an ever evolving category and every new launch makes the previous obsolete. So when an Apple discounts Nano after the launch of Nano with camera, buyer who has bought Nano at full price also understands that earlier price was an opportunity cost, without impacting the brand equity. Same is true for cars, when a new launch happens, say i-10 vs Santro from Hyundai and Hyundai offers Santro at a discount, it need not kill the demand of i-10. Some value conscious consumers might buy Santro instead of i-10 but in their mind the trade off of price and technology is clear. It does not devalue the brand. Apparel is far trickier to answer. Fashion is always about change, and in a way reflection of the consumer. Now if new range is distinctive from the old discounts it would not erode the equity but unfortunately it is not true every time. Some brands and their products are so generic that it is impossible to differentiate the two and that’s where the issue comes. Now change could be color, cut, shade, design anything but in apparel a majority of Indian brands have not been to establish that and even otherwise a majority of Indians are not fashion conscious, hence erosion of brand equity with established seasonal discounts gets eroded rapidly. Bottom-line is, discounts work for brands only when the reason of discount is well established and consumers can answer the brand is offering a discount because of a well defined and well understood reason. Trade off between new and old is when discounts do not impact brand equity, if that difference is not established it leads to dilution of brand equity and loss of margins. And the market is strewn with such examples where brands have not been able to achieve this; white goods, apparel, fashion accessories, footwear and zillion more – and today are victims of “I will buy during the discount season” mentality. 4. There is marked difference that segregates the old from the new, which is felt by the buyer either in perception or by any of the five senses. SS: Last words of wisdom for Retail Marketing Managers? RK: There are no simple or easy answers. Thank you Raman, and wish you all the best for your upcoming Shopping Festival.